A perfect day out for the whole family, Baku contains a water park with gentle slides and shallow pools for young children, an exciting 'animal experience' feature, and Parque Europa which opens in the evening offering a range of shows and entertainment. 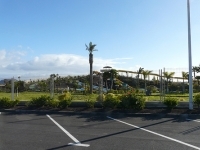 The variety of slides makes the park fun for people of all ages and features like the Big Jacuzzi, the lazy river and the wave pool will appeal to those who shy away from the more thrilling rides. For very young children there is an infant play area, but the park is definitely geared towards kids and many of the slides are child-friendly, with only a few exceptions. There is even a mini-golf course if the family needs a break from the water for an hour or two. There is a kiosk selling a variety of food for replenishing energy and on week days, between 9am and 2pm, there is a crafts market set up in this area where visitors can browse for souvenirs from the Canary Islands and even the nearby shores of Africa. For simple fun in the sun the Baku Water Park is a great attraction - just take plenty of sunscreen. Check out the website for details on the free bus to the park which services Castillo, Jandia and Costa Calma on certain days. Opening times: Open Monday, Tuesday, Friday, Saturday and Sunday from 17 May to 20 June and 20 September to 30 November from 10am to 5pm. Open Daily from 10am to 6pm from 21 June to 19 September. Admission: €25 (adults), €19 (children and seniors). Concessions available; the price is reduced after 3pm.